If you’re a Google+ user like me and using it most of the time to connect with social media peoples or your friends. Google+ is a nice place to share your view, articles, ideas and opinions. But sometimes you don’t want to share all your thoughts with all your friends or public, so at that moment you want to send some private message or DM to a person. 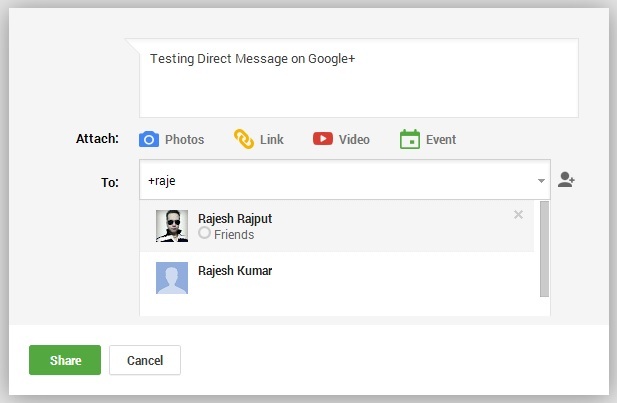 But in Google+ you can’t find the Message option to sedn a DM to your friends, like all the other social network sites like Facebook and twitter had this feature which allows you to send a direct message to your friends, so no one can read your personal message on your account. 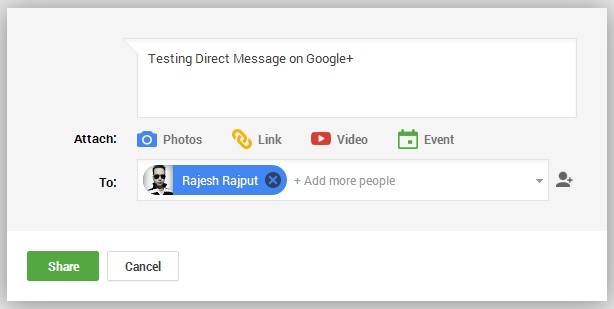 But in Google+ you can find this feature to send private message to another specific Google+ user? But with a simple and easy trick you can easily send a private message or DM in Google+. No need to install any addon or use any application to send a DM from your Google+ account. Read this article to find out how to send DM from Google+ Account. Let’s take a quick look how to send a DM or private message to anyone in Google plus. First login to Your Google+ account with your Google username and password. Once you are on the Google+ streamline click on the compose message that you want to send in the share box at your Google plus steam. On the compose box you will see some circle name such public, you circles and more. Remove all the circles from the compose box so no one can see your private message on your Google+ Profile. Now on the To section add the name of your friend that you want to send the message. To add you friend name type +your friend name and you can see your friends with that name in drop-down box as suggestion, Select the desired person name form that suggestion box to send a message. Now your friend name will be added on the compose box, with the same way you can add more friends on the list to send the same message to all of them. After that write down your message in the Compose window and hit the Share button to send a private message or DM from your Google+ Account. That’s it, now your private is sent to the person and the recipient can read your private message and reply to it, either in the comments or by sending a message back to you directly to your Google+ account.